I'm just back from a week away on the remote Scottish Island of Coll, the inspiration for the setting of the Katie Morag stories, written and illustrated by Mairi Hedderwick. I've always had a soft spot for the Katie Morag books and also for the artwork of Mairi Hedderwick which can also be found in her books for adults. I particularly enjoyed `An eye on the Hebrides' . If Katie Morag is new to you - try the Random House - Katie Morag website. `Katie Morag and the Two Grandmothers' was used as the basis for a KS1 scheme of work for Year 2 children called `An island home' (though looking at it now I can see that it is both dated and rather uninspiring). 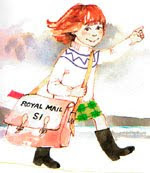 I always did think that `Katie Morag delivers the mail' and `Katie Morag and the new pier' provide a much better geographical insight of her island. Visiting Coll has brought home to me the historical setting of these books and how much the island has changed since `Katie Morag's' time. It's also made me think about how important it is to remember that Struay, the fictional island that Katie lives on is not Coll, though Mairi Hedderwick cleverly incorporates many of the features of Coll into her map of Struay. Why not download the map from the Random House website and have a look. I've begun to add some of my own images of Coll onto my Flickr website and also to have a look at other websites that feature the island. My first choice would be Google Earth (GE) or alternatively Google Maps if you don't want to download GE onto your computer. Street View is now available for the island which gives a very good `sense of place'. Additional photographs from the Panoramio website show places that the Google streetview camera misses - so lots of useful resources to complement a study of `Island Life'. Geograph would be my second recommended website - people have been very busy uploading their images onto this site. The `OS photo locator map' on the site is very interesting because it shows the popular places for taking photos. It also shows places where no photographs have been taken (something incredibly rare in the Geograph world). The absence of photographs occurs where there are no footpaths and the islands terrain is made up of moorland, rocky outcrops and boggy hollows - the inaccessibility of some areas of countryside is something you could share with children. There are several island websites that I've found very useful. Visit Coll has wonderful photographs as well as lots of information about the island. You can also download a pdf brochure about the island from I Love Coll. I've also found a website/ blog set up by Annette Pyrah (which sounds like a good Yorkshire name to me): Isle of Coll Cottage which I've enjoyed and which has provided me with links to the history and wildlife of the island. I'm in the process of trying to put an article together for Primary Geographer magazine - so more on Coll to follow. Please let me know if you find any of this useful.